Upon the revolution of high temperature superconductors, nanostructured coated conductor (a thin layer of high-temperature superconductor ceramic material deposited on top of flexible metallic substrates) emerged as a smart conception to leap forward high temperature superconductors’ cost/performance to material device integration levels.The fabrication of RE(=Y,Gd)Ba2Cu3O7-x nanostructured coated conductors by the incorporation of nanosized oxide secondary phases has been shown to strongly enhance their performances, ensuring great potential for use in a broad number of applications. 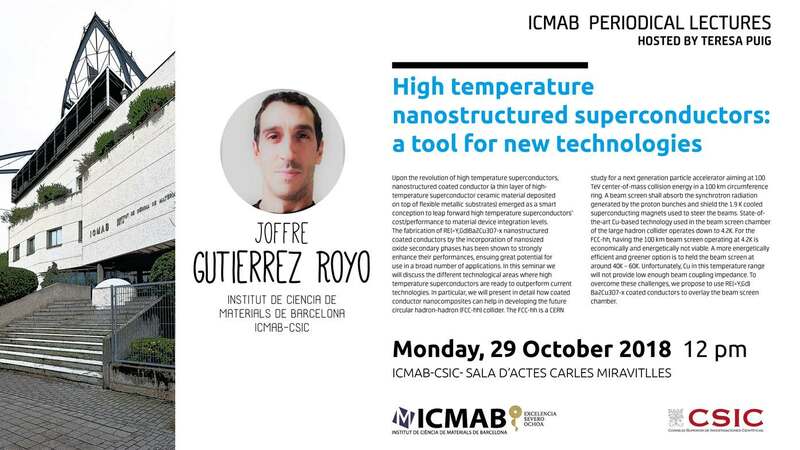 In this seminar we will discuss the different technological areas where high temperature superconductors are ready to outperform current technologies. In particular, we will present in detail how coated conductor nanocomposites can help in developing the future circular hadron-hadron (FCC-hh) collider. The FCC-hh is a CERN study for a next generation particle accelerator aiming at 100 TeV center-of-mass collision energy in a 100 km circumference ring. A beam screen shall absorb the synchrotron radiation generated by the proton bunches and shield the 1.9 K cooled superconducting magnets used to steer the beams. State-of-the-art Cu-based technology used in the beam screen chamber of the large hadron collider operates down to 4.2K. For the FCC-hh, having the 100 km beam screen operating at 4.2K is economically and energetically not viable. A more energetically efficient and greener option is to held the beam screen at around 40K – 60K. Unfortunately, Cu in this temperature range will not provide low enough beam coupling impedance. To overcome these challenges, we propose to use RE(=Y,Gd)Ba2Cu3O7-x coated conductors to overlay the beam screen chamber.